macaroni & cheese: There's Gno Business Like Gnome Business!! 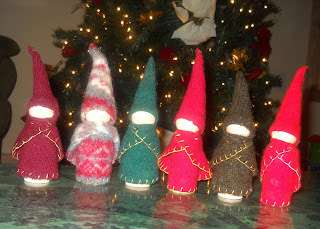 There's Gno Business Like Gnome Business!! 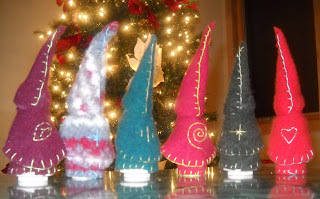 Let it gnome, let it gnome, let it gnome!! 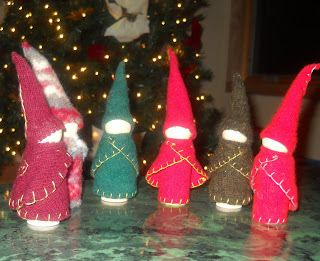 I made up this herd of gnomes for the little ones this Christmas. My friend Hani told me about a place in Fort Worth that ships these pegs, and they're pretty cheap if you buy a lot of them. I bought 10 of each shape...I *think* the wide one is supposed to be a female, but I dressed them all the same, anyway. I used some of my never-ending wool scraps, and embroidery floss. And some wood glue. I worked on these six for three hours last night, then three hours today, so I'd say they take about an hour apiece, to make. So cute! I'm jealous of all your wool scraps. 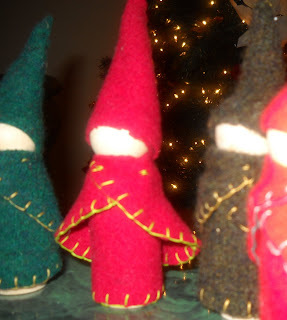 I keep seeing projects made with felted wool and wishing I had some. I keep trying to find crafts to use up my scraps, but crafts are SLOW. I may well be using these scraps for the rest of my life. soooo cute!! i think i'm going to have the boys work on projects like this when they are home from school all those days! !